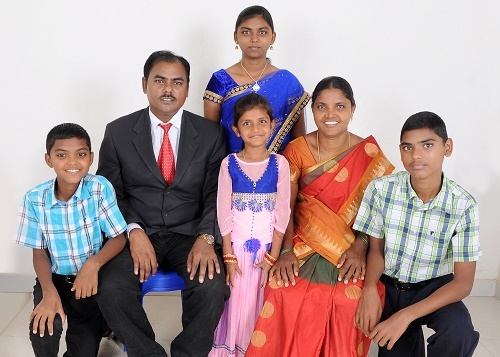 CHENNAI, India (BNC) — The R. Sevya Nayak family are dedicated to the Lord and to learning. The four children are all first in their class at school. Like most children in India, they sit on the floor to study. 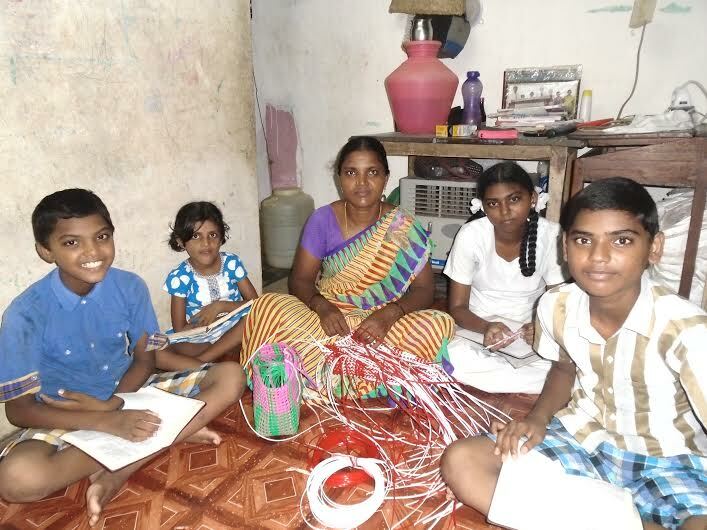 Sevya, the father, is a teacher and translator at the Chennai Teacher Training School. He is a graduate of the school himself. Originally a Hindu, he said that when a member of the Lord’s church in Andhra Pradesh showed him Psalm 115:2-8 he understood who the real God of heaven and earth is. Sevya has worked after class hours as a guard and maintenance man to earn extra money to help support their extended family on both sides. Lali, the mother, teaches weaving to the female students at CTTS on Sunday afternoons. The school has a community service program that teaches various skills to adults and children who live near the school. Lali has a sister and a brother-in-law who attended CTTS. The oldest daughter, Zena, who is 16, hopes to go to medical college when she graduates from secondary school. Sister Beth Johnson has taught the three older children in her Sunday school class since they were small. When Zena was three, she could say 85 memory verses in English, just one of their five languages. When she was four, she could say all the books of the Bible with their categories, the days of creation, the judges, the sons of Jacob, the 10 plagues and label with crayon which tribe settled in which part of Israel. The oldest son, Samuel, who is 14, could recite all 176 verses of Psalm 119 when he was nine years old. Now that Samuel is older, his class is taught by one of the men in the congregation. Yet he still likes to recite Scripture he has memorized to his former teacher. Recently he asked sister Johnson if he could recite some memory work to her after her ladies’ class on Sunday afternoon. To her surprise, he recited the entire book of Hebrews and only had to be corrected in a place or two! The youngest daughter, Naomi, age 7, also makes the highest grades in her class at school. Inspired by her older brothers and sister, she is also learning Psalm 119 and recites portions of 5-10 verses at a time to sister Johnson. The children studying while their mother is weaving. I have made on trip to India and found the people to very open to the gospel of Christ. My partener and I had about 200 obey the gospel during this trip. My dear friend and brother in Christ, Jim O’Connor, who just departed this life; gave much of life to teaching the gospel to the people in Inida. For me to read of this desire to know by heart the word of God is not surprising; as this is one of the things I remember about the people of India! Please forgive my spelling, but my health is very bad and my mind does not always work!